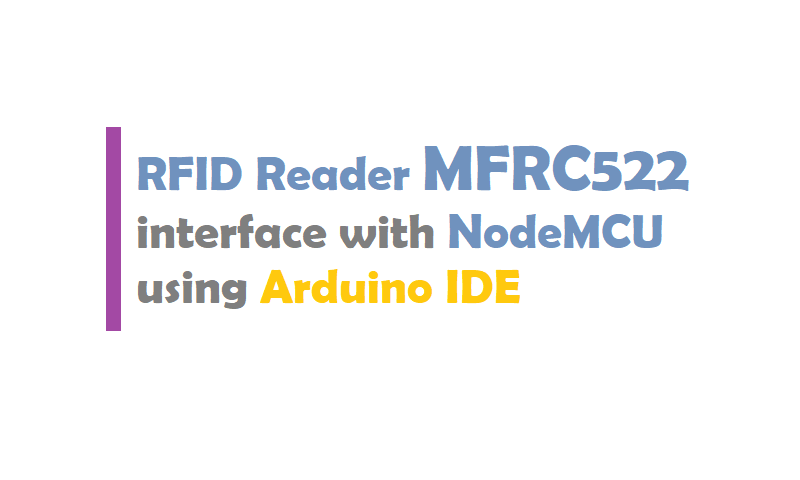 In this tutorial we will learn How to interface NodeMCU with RC522 RF ID Reader using Arduino library for MFRC522 and other RFID RC522 based modules. This library read and write different types of Radio-Frequency IDentification (RFID) cards on your Arduino or NodeMCU using a RC522 based reader connected via the Serial Peripheral Interface (SPI) interface. Radio-frequency identification (RFID) uses electromagnetic fields to automatically identify and track tags attached to objects. The tags contain electronically stored information. Passive tags collect energy from a nearby RFID reader’s interrogating radio waves. Active tags have a local power source (such as a battery) and may operate hundreds of meters from the RFID reader. Unlike a barcode, the tag need not be within the line of sight of the reader, so it may be embedded in the tracked object. RFID is one method of automatic identification and data capture (AIDC).